Nathan Walker still can recall how impressed he was the first time he witnessed a hockey game in his hometown of Sydney, Australia. He was inspired so much, in fact, that he decided to lace on the blades and give the sport a shot because it was "something different" to do in a country dominated by football and soccer. "Soccer wasn't a sport that really fit with me too well," Walker told NHL.com. "I can kind of kick a ball but I don't know what direction it's going in. Hockey isn't the most popular thing in Australia; it's certainly not the No. 1 thing to do on a Saturday night." While it might not be the thing to do, Walker made certain to watch, practice and play as often as possible. "When I was 13, that's when I decided I really wanted to take a shot at this, so I went overseas [to the Czech Republic] to learn and play the game," Walker said. Walker, a left wing, has dreams of becoming the first Australian to play in the NHL. Despite the fact he didn't hear his name called at the 2013 NHL Draft -- the second time he's gone through the annual selection process -- the 19-year-old is experiencing training camp with the Washington Capitals on a tryout basis. 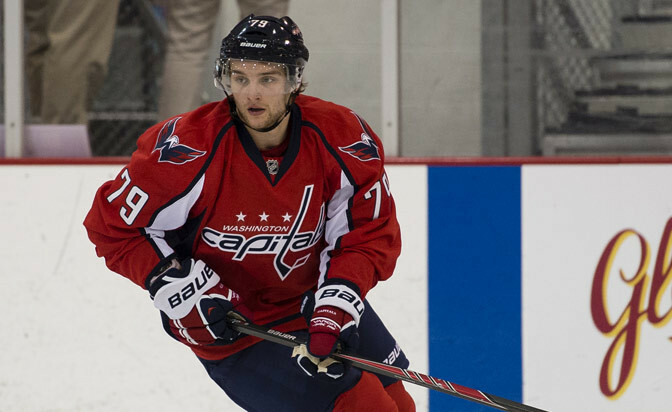 He is one of 40 forwards listed on the Capitals' roster. "It's been great," he said. "I had a good rookie camp and then got the invite to the main camp, so it's gone well. I'm thoroughly enjoying it. I've had the most fun playing hockey the last three weeks than I have in a while." Walker played in his first preseason game Sept. 14 against the Winnipeg Jets in the Kraft Hockeyville game in Belleville, Ontario, and has skated with Troy Brouwer and Chandler Stephenson during several sessions of main camp. When Caps forward Brooks Laich left the first session of training camp with a hip flexor injury Sept. 12, Walker filled his spot on a line with Stephenson and right wing Brouwer. According to reports, Walker skated hard, was aggressive and pressured opposing defenders when given the opportunity in a 4-3 win. "I like to make plays and give the puck a lot," Walker said. "I use my speed and keep my feet moving at all times. The coaches have told me to have fun and just play hockey. That's what young guys need to hear." If he isn't signed by the Capitals, Walker will enter his first full season with the Youngstown Phantoms of the United States Hockey League in 2013-14. Minus a contract, the 5-foot-8, 186-pound left-handed shot also will be entering his third and final season of draft eligibility. "I wouldn't say it's frustrating [to not be drafted]," Walker said. "It's not what I wanted, but it's not that big a deal either. It just motivates me even more just wanting to be better than I am. Not getting called out [at the draft] just motivates me even more." Walker joined the Phantoms in January 2013 after playing six seasons of hockey in the Czech Republic, including the past two with HC Vitkovice in the top Czech professional league. Born in Cardiff, Great Britain, his family moved to Sydney when he was 2 years old. He then moved to Ostrava, Czech Republic, where's been developing his game the past six seasons. "My time in the Czech Republic was so important; that's when I really developed," Walker said. "I wasn't really going to develop in Australia since I was on the ice once a week and playing one or two games, so making the transition to Czech Republic was a huge part of my development." Walker acknowledged that there are about 30 rinks in Australia, so there isn't much ice time to go around for those interested in the sport. "I like the fact that what we do on ice is so much different than playing football or soccer," he said. Walker started last season with Vitkovice's under-20 team and had 12 goals and 24 points in 13 games. He had one assist and 29 penalty minutes in 20 games with Vitkovice, and then moved across the Atlantic to finish the season with Youngstown. In 29 games with the Phantoms he had seven goals, 27 points and a plus-5 rating to help the club overcome a 5-11 start to finish third in the USHL's Eastern Conference. He even starred at the 2013 USHL/NHL Top Prospects Game at the L.C. Walker Arena in Muskegon, Mich.
"It took some time getting used to the USHL on the smaller rink [in North America] as compared to the Czech Republic, and the speed of the game, but after a while it went really well," Walker said. Walker sustained a serious neck injury in the team's 5-2 regular-season victory against the U.S. National Team Development Program under-18 team April 5 and sat out the playoffs. "Walker is a great skater and works hard on every shift," NHL Director of European Scouting Goran Stubb told NHL.com. Despite his smallish frame, Walker has earned the nickname "Stormy" for his aggressive and relentless puck pursuit each shift. He had been training in the Czech Republic early this summer before returning to Australia. He played for Australia at the 2011 IIHF World Championship Division II tournament and the following year played for Australia at the 2012 World Championship Division IB tournament, when he had four goals and six points. He was recognized by tournament coaches as Australia's best player. When asked for the odds of his becoming the first Aussie to play in the NHL, Walker laughed. "It's definitely not an easy road," he said, "but I'll keep pushing and we'll see where it ends up."